Penguins’ GM Ray Shero knows something about getting the most bang for Mario Lemieux’s buck. Since the lockout, the Penguins have almost always spent to the cap ceiling, and Shero has managed to consistently assemble rosters abundant with star talent at all positions in addition to finding highly productive, low-cost role players. When a GM is able to find a star-caliber player and sign him for relatively little, its pure gravy, and perhaps no player is providing better return for his salary than Penguins’ Kris Letang. The 24-year-old defenseman is in the second of a four-year deal that pays him $3.5 million annually with an equal cap hit. Like the rest of the Penguins’ stars, Letang received a modest deal (only four years for a young defenseman who, at the time of the deal, was projected to be entering his prime) when players were receiving more lucrative deals from lesser teams. Letang didn’t have the benefit of signing in a terribly weak free agent class (James Wisniewski at $5.5 million per season, for comparison), and his deal is now looking like an absolute steal for it. In 2009, a fleet-footed defenseman with offensive flair and room to grow was considered a savvy signing at $3.5 million. Since then, Letang has been sensational, and his contract is among the best bargains in hockey. He was an early favorite to win the Norris Trophy last season before injuries to the team’s stars and a drop in production took him from the race, and he is again an early favorite to win top defenseman honors this season. 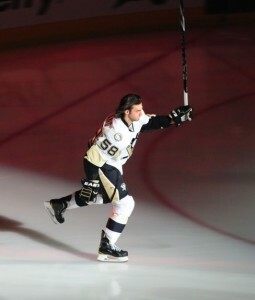 In 13 games, Letang has posted one goal and 12 assists. His 13 points trail only James Neal’s 14 for the team lead, his point-per-game average is second to only Evgeni Malkin (1.25 PPG), and he leads the team in assists (12), plus-minus (plus-4), power play assists (6), power play points (7) and ATOI, a monstrous 27:10 per game. League-wide, Letang has the fifth-most assists amongst defensemen, and has played as least two fewer games than the four players ahead of him in that category. He’s also tied for 6th-most assists in the NHL amongst all skaters. As far as TOI, only Dan Girardi, Ryan Suter, Brian Campbell and James Wisniewski are logging more minutes per game than Letang. Of that group, only Dan Girardi makes less money than Letang ($3.25 million per year versus Letang’s $3.5 million). 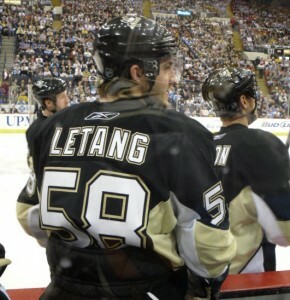 For a player whose name routinely enters trophy discussions, Letang’s cap hit seems incredibly valuable. Other NHL names to carry a cap hit near Letang’s $3.75 million include Scottie Upshall, Jarret Stoll, Filip Kuba, Sean Avery and Gilbert Brule—none of whom figure to contend for the top honors at their respective positions. Compared to the rest of the NHL, Letang’s contract is a relative steal. The Penguins see every day what he brings outside of the score sheet, and Letang’s value to the battered club can’t be overstated. Injuries to the Pittsburgh blue line have shuffled the regular pairings, and Letang has been one of the only healthy defensemen the Pens have had this season (Deryk Engelland and Paul Martin are the only other defensemen who haven’t been injured scratches at least once this season). Letang was also one of only two Penguins skaters and the only defenseman to play all 82 games last season (Max Talbot the other). He has only missed two games (suspension for hit on Alex Burmistrov) since the beginning of last season, and has played in fewer than 70 games in only one season in which he was with Pittsburgh full-time. He’s also a staple on the team’s top power play unit (ranked 7th in the NHL at 21.3 percent) and a key member of the top-ranked penalty kill (93.2 percent). Despite his versatility in all phases of the game and the insane minutes he has been asked to eat up this year, Letang is only the fourth-highest paid defenseman on his own roster. Brooks Orpik ($3.75 million), Paul Martin ($5.0 million) and Zbynek Michalek ($4.0 million) each make more per season than Letang, yet Letang bests each of them in points, plus-minus and TOI, and has done so since last season. With Orpik (injury) and Martin (age) unlikely to receive further long-term extensions after their current contracts expire, Letang will soon be the elder statesman of the Pittsburgh blue line. His time alongside veteran Sergei Gonchar helped to groom him for the role, but Shero will have to be creative in his cap maneuvering to get Letang under the cap. Evgeni Malkin, Brooks Orpik and Chris Kunitz will be due for contract extensions in 2014, the same season as Letang. That’s also one season after the deals for Sidney Crosby and Jordan Staal are due to be extended or expire, and a season before Marc-Andre Fleury’s deal expires. Kris Letang will be due for a raise when Shero and the Penguins will be in the thick of trying to retain their highest-paid players, and Letang’s status will be affected by the impending renewal of the NHL collective bargaining agreement, as well as the inflated contract values brought about by this year’s creampuff free agent class. How those factors play into the Penguins’ ability to re-sign their star defenseman will be another challenge for Shero and his team of cap strategists to conquer.